Durable (Financial) Power of Attorney – A durable and financial power of attorney gives the agent the authority to conduct financial transactions on your behalf even after you’ve become incapacitated. The downloadable available through the buttons on this page supply the hard copy format a Principal must use to appoint an Attorney-in-Fact with the Health Care Powers. Gain access to the PDF, MS Word, or ODT version of this document using these buttons. The table labeled “My Personal Information” will open this template with a few requests regarding the Principal Identity and Contact Information. Fill in the Full Name of the Principal on the blank space after the word “Name” After identifying the Principal, fill in his or her “Street Address” and “City, State, Zip Code” on the next two blank lines in this table. The next line will be divided so the Principal’s “Telephone” number and “Cell Phone” number can both be reported in a distinct area. Finally, use the “Birth Date” line to document the Birthday of the Principal. In Part I, a choice of naming a Health Care Agent will be supplied. 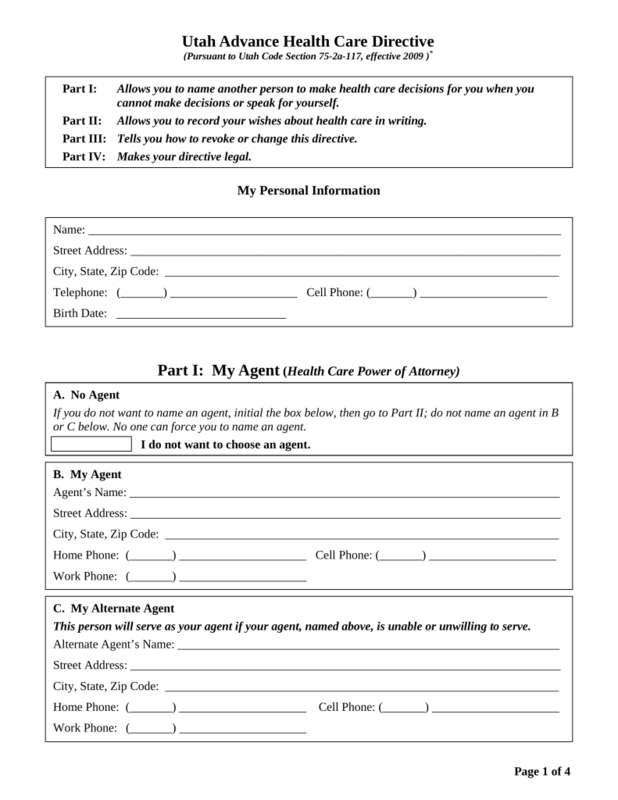 If the Principal does not wish to grant Principal Powers to a Health Care Agent, he or she must initial the box that precedes “I Do Not Want To Choose An Agent” in the section labeled “A. 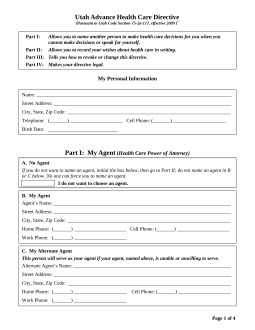 No Agent” If the Principal intends to use this paperwork to name a Health Care Attorney-in-Fact, then this Health Care Agent’s information should be clearly presented for the purpose of this paperwork. Section “B My Agent” will contain several designated lines so this can be accomplished. Use the “Agent’s Name” line in this section to record the Health Care Attorney-in-Fact’s Legal Name. Next, document the Health Care Attorney-in-Fact’s Address using the blank lines labeled “Street Address” and “City, State, Zip Code” The Attorney-in-Fact’s “Home Phone” number, “Cell Phone” number, and “Work Phone” number must be supplied to the remainder of this section. The Principal can also name an Alternate Agent in section “C. My Alternate Agent,” but only if he or she has named a Health Care Agent in section B. The Principal who wishes to grant an Agent the Authority to make Health Care Decisions should read Section “D. Agent’s Authority.” The Principal will have the opportunity to address issues important to him or her in another section but this one must be read and comprehended completely by the Principal before continuing. The next section, “E. Other Authority,” focuses on some additional matters that cannot be granted as a default of issuing this paperwork. That is, the Principal Preferences must be disclosed by the Principal. This can be done with two simple “Yes” or “No” statements. The first statement will approve or forbid the Agent’s use of Principal Power to access and gain copies of the Principal’s Medical records even when the Principal is capable of speech and communication. The Principal must either initial the “Yes” line or the “No” line to either grant this Principal Power or deny it (respectively). If the Principal wishes to give the Health Care Attorney-in-Fact the Principal Power to admit him or her to any of the Health Care Facilities listed in the second statement, then he or she should initial the “Yes” line in the second statement. If not, then he or she should initial the “No” line. The Principal retains the right to adjust the Principal Health Care Powers an Agent is granted when he or she issues this type of paperwork in Utah. Such Principal Preferences or Directives should be amply described in “F. Limits/Expansion Of Authority.” The Principal may wish to limit or even forbid the Agent’s ability to make certain decisions or taking certain actions on his or her behalf. Additionally, the Principal may have religious concerns regarding Health Care, he or she may wish to supply very specific instructions regarding what types of Health Care procedures or extend the Agent’s Powers. These are just some of the subjects that may be covered when the Principal considers what to include here. If there is not enough room, you may add an attachment with the Principal’s Instructions/Considerations. If there are no such directives, write in the word “None” The Principal can also decide to Nominate the Health Care Agent listed above as his or her Guardian. This is in case the courts determine the Principal needs a Guardian if the Principal is incapacitated. If so, the Principal should initial the line labeled “Yes” in section “G. Nomination Of Guardian.” If the Principal does not want to submit the Health Care Agent above as a Guardian Nomination the courts should consider, then he or she should initial the line labeled “No.” It should be noted; the courts will only take this into consideration. This paperwork will not necessarily prevent the court from naming a separate entity as the Principal’s Guardian. The Principal can authorize the Health Care Attorney-in-Fact to decide on the enrollment of the Principal as a participant in medical research. If the Principal intends for this Power to be delivered to the Agent, then he or should initial the “Yes” line in section “H. Consent To Participate In Medical Research.” The Principal can also restrict this Principal Power from the Agent’s use by initialing the “No” line in this section. The next section, “I. Organ Donation,” will discuss the subject of anatomical gifts. If the Principal has determined the Health Care Attorney-in-Fact should be able to make a decision on whether any of the Principal’s organs can be donated for organ transplantation, then he or she should initial “Yes.” If the Health Care Attorney-in-Fact should not have the right to make such a decision on behalf of the Principal, the Principal should initial the “No” line. The Principal must sign the “Name” line at the bottom of this page. The Principal can choose to dedicate the terms of a Living Will consisting of directives that should be followed if he or she is ever incapacitated and is facing a life-threatening medical event. Three options have been supplied for this purpose. The Principal should read through the options in “Part II: My Health Care Wishes (Living Will) with the intention of initialing only one of these options. The definitions and instructions listed here will not be considered the Principal’s Directives unless the Principal signs this document. He or she should now focus on “Part IV: Making My Directive Legal” Here, on the day of the Principal Signing, the Principal must enter the current Calendar Date on the line bearing the label “Date” Immediately after entering the Date the Principal must sign the blank line just above the word “Signature.” Finally, the Principal should enter the City/County and the State where he or she resides on the blank line below the signature. Next, a Witness who has witnessed this signing must be able to sign his or her Name to verify the next statement and all the numbered points below it as true. The Witness must sign his or her Name to the “Signature Of Witness” line then print his or her Name on the “Printed Name Of Witness” line. After supplying his or her Name as both a signature and printed, the Witness must use the lines labeled “Street Address,” “City,” and “State to document his or her Residential Address. In some cases, this Health Directive may be an oral account of the Principal’s Wishes. If so, the exact circumstances defining how and why the Principal has not tended to this document should be supplied to the blank lines under the statement beginning with the words “If The Witness Is Signing To Confirm An Oral Directive…” The Principal’s Name should be signed to the bottom of this page on the “Name” line.